The MadWorld 2018 conference is approaching fast. With three full days of learning, four evening networking events, miles of coastline and an endless list of fun things to see and do in America’s Finest City — planning your days, and your week (if you’re lucky) ahead, is essential to getting the most out of your visit. If you haven’t had the time to lay out your plans, rest assured, we’ve put together a short resource guide to help you maximize your time at MadWorld and in San Diego. With 40 sessions presented over four conference tracks, it’s important to identify which sessions and topics would most benefit your professional goals. Talk to your colleagues if there are particular sessions that are valuable to the team. If you have coworkers attending as well, you may want to divide and conquer sessions, and swap notes afterwards. But if you miss out on any sessions, we’ll be sending out session presentations to all attendees after the conference, so you can take those best practices back to the office. Available on iOS and Android, the official MadWorld Conference app is a great resource to help you plan out your schedule, network with other attendees, and stay up to date on news regarding the conference. You can also save sessions that you want to attend to the app, ensuring that you won’t miss your next learning opportunity. The app also features gamification, where activity on the app gets you points, and attendees with the highest point totals will win prizes and giveaways. Bonus tip: session reviews get you the most points, so make sure you leave your thoughts after each session. We encourage you to drop into the Hospitality Lounge at any time during the main conference to get one-on-one support from our technical support team members. Have a question about a particular project? No problem. Can’t seem to find the right way to implement a feature? We can help. Bring your laptop and sit down with a support representative, put your project on a thumb drive, or just come ready with your questions and we’ll be happy to assist. Appointments can also be made for your convenience. The lounge also features charging stations, lounge chairs, water and coffee stations to keep to energized all conference long. As the largest annual gathering of MadCap Software users, MadWorld is your chance to make new friends and swap tips with experienced colleagues. There’s plenty of opportunities to network, ranging from the evening events by the beach, the lunches and breaks throughout the conference, or during the sessions themselves. And don’t forget to get social online as well! Share your insights, takeaways, and photos on social, using the #MadWorld2018 hashtag. 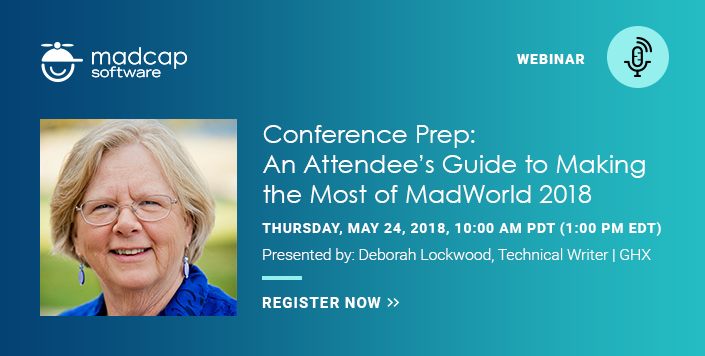 For more tips on how to make the most of MadWorld, you won’t want to miss our webinar next week with Deborah Lockwood. As a veteran MadWorld attendee, she’ll share best practices on how to plan for the conference and report and deliver insights to your colleagues. Best of all, she’ll suggest steps for bringing your MadWorld experiences back to the office, provide tips on retaining those fantastic ideas, and propose tactics for leveraging the valuable content you will learn. If you’re planning to extend your stay before or after the conference, there’s no shortage of places to explore in San Diego. From the beaches of Coronado, the nightlife of Gaslamp Quarter, to the craft breweries and outdoor activities all over the city, the challenge is making sure everything fits into your itinerary. 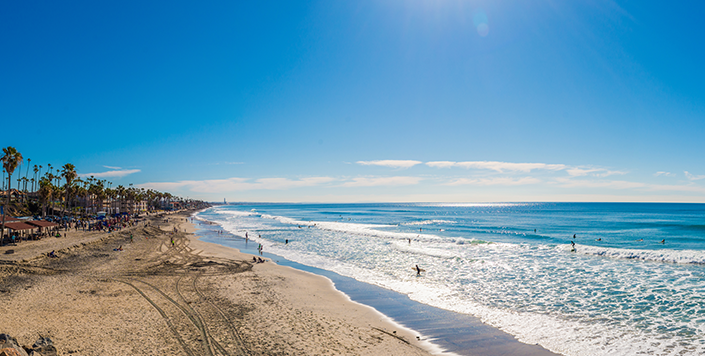 Make time to explore Coronado. Take a stroll down Orange Avenue, Coronado’s main street, which is lined with shops, restaurants, galleries, theaters and the Coronado Museum of History & Art. At the other end of the island, Coronado’s Ferry Landing offers a collection of shops and restaurants offering stunning views of San Diego’s downtown skyline. Flagship Cruises also offers a ferry service from the landing across the bay to Seaport Village on the edge of downtown. Coronado is also home to one of the largest naval bases in the United States. The Naval Air Station North Island, commissioned in 1917, is located at the north end of the Coronado peninsula on San Diego Bay and is the home port of several aircraft carriers of the United States Navy. 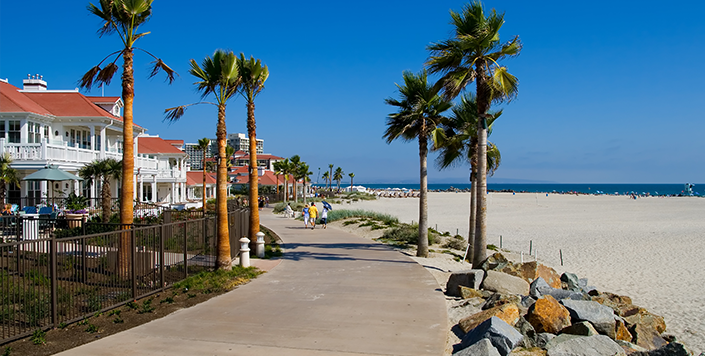 Don’t forget to explore the Hotel del Coronado itself, along with the beaches just a couple of steps away from the historic hotel. The ride to Coronado from the San Diego International Airport passes by downtown San Diego, home to the Gaslamp Quarter and some of the best restaurants in town. Stop by Oscar’s Mexican Seafood for authentic ceviche or tacos, or enjoy a cocktail at Prohibition Lounge, a 1920’s themed bar. Or if you have a couple of hours, check out Seaport Village, a waterfront boardwalk with unique stores and delicious eats. If you find yourself arriving a day early, why not check out a Padres baseball game? The San Diego Padres are offering MadWorld attendees a special rate for Saturday, June 2nd. Whether from the stadium or a rooftop bar, exploring Downtown is a great way to kick-off the upcoming conference. To book your discounted tickets to the Padres, register here. Interested in what’s beyond Downtown? 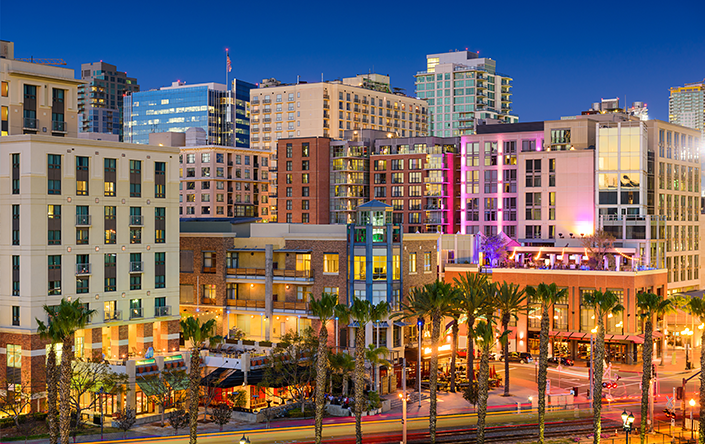 The diverse neighborhoods and sights of San Diego is just a short trolley or Lyft ride away. Visit the eclectic neighborhood of North Park, grab an espresso in Little Italy, or a taco anywhere you go. Or explore the cliffs and see the seals in La Jolla (home of MadCap Software!). Fan of craft beer? With some of the biggest names in craft beer such as Karl Strauss and Ballast Point, visiting a brewery is a must. Or if you’re extending your conference stay with your family, there’s plenty of family-friendly attractions such as the USS Midway Museum, Flagship Cruises, and more. Using Lyft for the first time? Attendees get $5 off your first 2 rides with the code MADWORLD2018. Sign up here. Got any tips to share for first-time MadWorld attendees? Leave your recommendations in the comments below. We look forward to seeing you soon in San Diego!